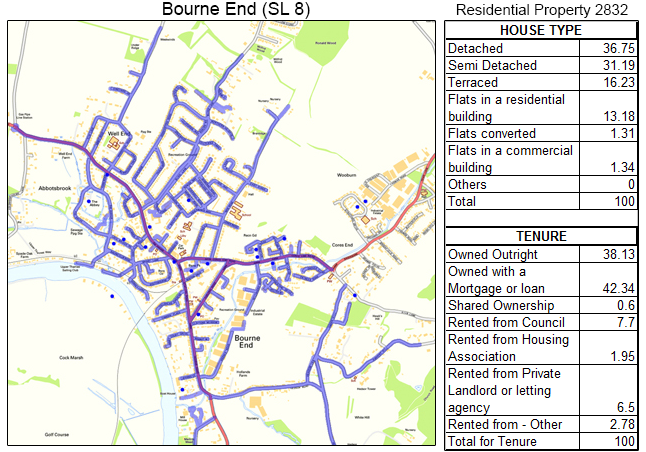 For the best GPS tracked leaflet distribution Bourne End SL8, Shareplan Leaflet Distribution can offer you a complete service. Bourne End is a residential village with road links to the M4 and M40 motorways, making it a desirable place for commuters to live. During the 1920’s it was also a popular location for literary figures to settle, becoming a home for both Enid Blyton, a famous children’s writer, and Edgar Wallace, a dramatist and crime author. Through our geoplan map we know the total number of residential delivery count is 2832. Approximately 80% of these properties are either owned outright or with a mortgage or loan. This data can help you position your product and services to the targeted demographic audience, like providing domestic testing and installation services to home owners who are looking to make sure everything is in good condition. This could range from boiler servicing to central heating or just general plumbing maintenance. 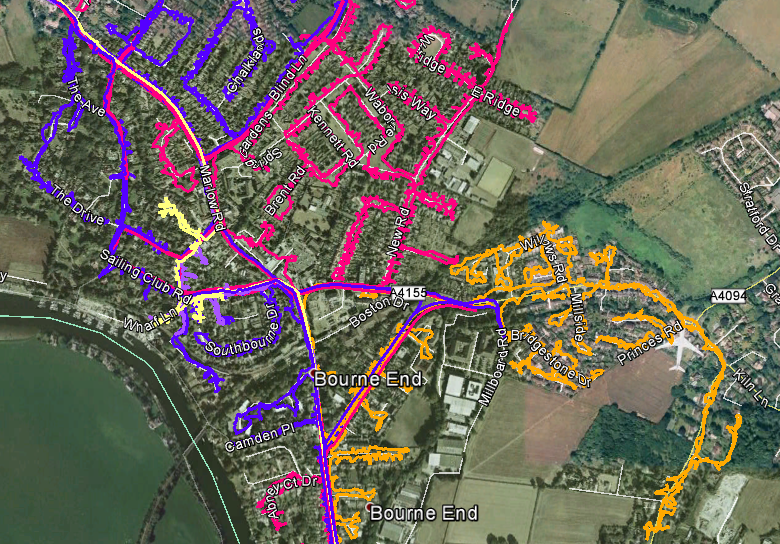 Our Bourne End door-to-door delivery service is second to none and all of our flyer deliveries are GPS tracked. We will provide you with a report when the flyer delivery has been completed. It only takes a few moments to download the data and then you can view the exact route the flyer delivery person took to deliver your flyers. In addition to providing reliable and affordable flyer distribution in Bourne End, we can also offer geotargeting to ensure you are delivering to the right target audience. For example, you can give us a royal mail postcode in Buckinghamshire and we will simply provide a report and map showing the number of residential deliverable properties. Your leaflet design is integral for your delivery campaign to be as successful and efficient as possible. Therefore, we recommend that you take advantage of our free one-to-one consultation which gives you the opportunity to speak to one of our in-house marketing experts. After all, we want your campaign to be as successful as possible because the more successful you are, the more successful we are! If you are struggling to decide where you want to start with your flyer delivery campaign, you can even use our graphic design service. Our in-house design team will help you get the most from your direct response marketing. Of course, our exceptional door-to-door flyer distribution service wouldn’t be complete without offering you the unique chance to make massive savings on your leaflet printing! Get a discount on your door-to-door flyer delivery when you order both your leaflet printing and leaflet delivery together from us! With our flyer distribution service attracting a repeat business rate of over 78% in Buckinghamshire, you can’t go wrong with our complete service. Click the link to get your free quote now! Our door-to-door delivery is available in all the main towns in Buckinghamshire including: Marlow, Iver, Chalfont St. Peter/St. Giles, Gerrards Cross, Beaconsfield and High Wycombe. Please feel free to take a look at our other coverage areas and also visit our FAQ if you have any other unanswered questions.